How about some syrup with that spray paint? Gear up, Go Goer’s. The weekend’s most fun events all have drinking components. And that’s before we get to Cinco de Mayo. To Ms. Go Go’s knowledge, there is no marathon this weekend except the weekend itself. 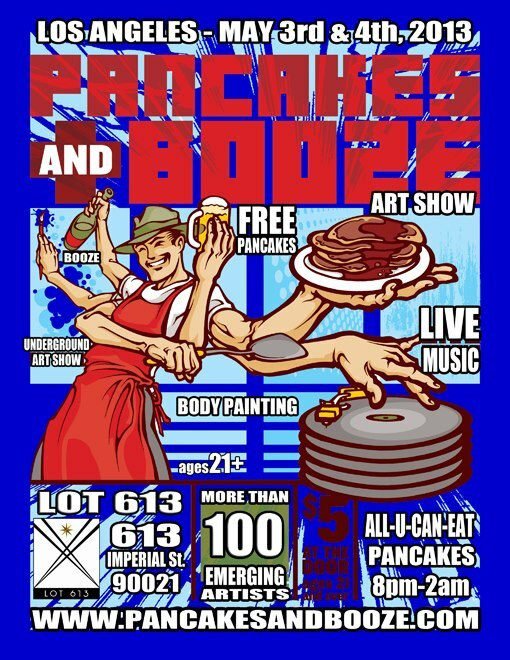 Accordingly, you’ll want to start carb loading on Friday, May 3rd at the The Pancakes and Booze Art Show. More party than posh, more underground than upscale, the bash serves up fun alongside the $5 for-all-you-can-eat flapjacks with fixin’s, the all-you-can-eyeball emerging art, the all-you-can-ogle body painting, and the all-you-can-dance music with eight bands a night including Pastries with Teeth. The Pancakes and Booze Art Show: where the baked goods bite back. For 50+ years, L.A. and environs had no breweries. Now, there are approximately a million, give or take a few thousand. One of Ms. Go Go’s faves? Angel City Brewing Company in the Downtown Los Angeles Arts District, which is celebrating its expansion this Saturday, May 4 with The First Annual Heritage Music & Arts Festival. Yes, there will be a ribbon-cutting ceremony. Yes, the Seoul Sausage Truck, The Melt, Son of a Bun, and Peddler’s Creamery will dish the delish. Yes, there will be a screen-printing station and the “In Your Face: How Artists Transformed LA’s Urban Landscape” exhibit. More importantly, there will be delicious beer. Most importantly, there will be you. A Blind Tiger beats a Blind Pig every time. In the 1920’s, knees were finally visible and flappers rouged them before swilling giggle water at blind tigers. You gotta celebrate rouged knees. 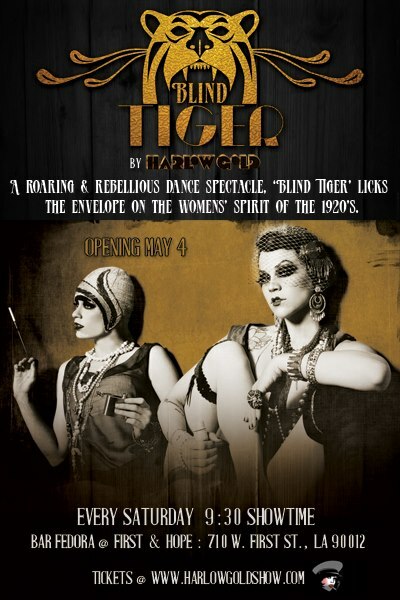 In Blind Tiger, the new show from Harlow Gold opening Saturday night, May 4th at the swanky Bar Fedora at First & Hope, you’ll see more than rouged knees. And you’ll be the one swilling the giggle water. Harlow Gold’s Tracy Phillips and Dominic Carbone have choreographed the Grammy Awards,Victoria’s Secret Fashion Shows, and Adam Lambert’s controversial performance at the American Music Awards. This weekend, their bevy of beauties bring their patented shake, sass and slink to the Bar Fedora stage with you as awestruck audience. Note: it’s considered bad form to swallow your olive. Previous Post The Weekend Go Go: French Fotos, Eat & Drink for Boston, A Hardboiled Dinner.